Roanoke. The oldest and one of the most compelling unsolved mysteries in the history of the United States. A brief synopsis… It’s 1587 and the British colony of Roanoke… well, they’re in trouble. Things in the New World aren’t going so well. In desperation, the governor, John White, sails back to England to get help. However, because of a little disagreement between the Brits and the Spanish, he wasn’t able to get back to Roanoke for three whole years (re: a little thing called the Spanish Armada). When White finally did make it back to his colony, the settlement was empty. Not a trace of the hundred odd souls he’d left behind could be found, and among them White’s daughter and grand daughter. The only clue as to their whereabouts was the name of a local Native American tribe, “Croatoan,” that was scratched into the wood of the fort. The settlers were never found and to this day no one knows the truth behind the disappearance, leading to much speculation and well… creepy and mysterious books like this one. Fast forward to fictional present day. Town outcast, Miranda Blackwood is used to the whispers, the condescension, the pitying stares. Her reject status determined long before she was even born; her notoriety earned merely by a fault of family heritage. But when she suddenly starts seeing unexplainable things, she has to wonder just how “freakish” she truly is. Meanwhile, town bad boy and outcast-by-choice, Phillips Rawling, has been attending a reform school in Kentucky for the last three years, but when 114 people go suddenly missing in his hometown of Roanoke – eerily similar to the disappearances over 400 years ago – his desperate police chief father brings Phillips home. And why? Because Phillips hears the voices of Roanoke’s past. It’s the reason he left, and he and Miranda may just find that they’re more tied to this island than they ever imagined. Miranda. Her dad currently starring in the role of “pathetic town drunk” and her beloved mother deceased, Miranda has essentially taken care of herself (and her dad) for years. The entire town views her with a mixture of apprehension and pity – a good-for-nothing from a screwed up family – based simply on her luck in the genetic lottery. Because of this, she’s largely friendless – alone in the world. To compensate for this lack of companionship and love, she fills her time faithful dog Sidekick, her job at the local theatre, and countless TV show marathons – Miranda has an adorkable wealth of pop culture references. But still, it’s not enough to fill the void. She’s strong and tries to pretend it doesn’t bother her, but she’s lonely and misses her mom terribly. Phillips. He hears dead people. <creepy whisper>Not knowing how to handle his unique…um… ability, Phillips instinctively knows that getting sent away from the island will calm the hurricane of voices swirling around in his head. At heart a good kid, he begins acting out in very public ways in order to make that happen. As I said he’s actually a pretty decent guy and he loves his parents a lot. He’s snarky, funny, intelligent, a strategist – charming but tough. Thinking on his feet, Phillips has an “I’m gonna roll with it” personality. And despite everything he’s seen and experienced, he’s still a glass-half-full kind of guy. He, like Miranda, is also sweetly dorky. Let’s be adorkable… together. Miranda and Phillips’ relationship is one that builds both quickly and slowly. Miranda is the girl Phillips never could quite shake and never forgot when he went off to Kentucky. Alternately, Phillips is an enigma to Miranda – the boy who once upon a time publicly humiliated her, but then looked at her with a sense of empathetic understanding. She doesn’t know to make of him, and so settles on “wary.” Phillips, though reluctant to return to the island, does so because he feels Miranda is in danger, and it turns out he may be right… At first, their “partnership” is one of coincidence and convenience, but these two slightly awkward loners may just find they understand one another in ways no one else ever has. A long time ago… I love well-researched books that make history interesting, and especially histories’ mysteries. But those of you who tend to groan when the mention of “history” comes up… never fear, this book is not overly historical or overly-saturated with weighty historical facts. In fact, if I didn’t know that Blackwood was based on actual occurrences, I’d just think it was a clever bit of original world building. But because it is based around a historical event and an extremely mysterious and possibly tragic occurrence in America’s past – one that’s always interested and slightly creeped me out – for myself, there was that added an extra level of “Oh, I must read this book!” excitement when first venturing upon Blackwood. From time to time, I found the story a tiny bit hard to follow as Blackwood is told in the third person and follow both Miranda and Phillips’ thoughts, which sometimes tend to ramble. But it’s part of what lends this book so much charm… and it also could be chalked up to formatting issues in the e-ARC. The build up of the mystery was very interesting and the mystery well-paced. Bond increases the level of tension, unease and creepiness very well. The only issue I really had with the pacing was near the end – it slowed and was a little strange. But all in all, the climax and conclusion were well done. Overall. 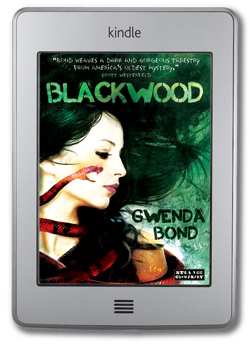 With two endearing and lovable main characters and a creative supernatural spin on a very real historical mystery, Blackwood is a well-crafted and intriguing paranormal explanation of the events surrounding the lost colony of Roanoke. LOL… thanks! ‘Tis a fun word, is it not? Like I said, if you didn’t know it was based on a historical event, you’d just think it was some really cool world building/plot set up. But I totally get that it’s not for everyone. Did you read/like Grave Mercy? It’s not as historical as that one. I Love the concept. I am obsessed with the Roanoke Colony. I have to read this one. Yes, it was quite original… and I just love how it’s based on a historical event! I’m really happy I’ve got this book – I’d seen iffy reviews but yours made me want to read it. I’ve heard that too, and I’m curious as to HOW. It’s a standalone and I’m just having trouble seeing how they’re going to stretch it into a series without pretty much changing the whole thing. Yeah, I’ll be interested in hearing what you think! And I know… I love, love, love history, and especially histories mysteries. So as soon as I heard it was about Roanoke I just had to read it. This sounds really interesting. Adding to my Goodreads. Thanks for the heads up! Yay! I hope you enjoy it! Thanks for commenting, Megan! I’ve been curious about this book for a while, and I heard it’s been optioned as a TV series by MTV. Not sure from the synopsis (or your review) how it would work on the TV medium, but who knows if it’ll even get to the point of production? Thanks for the review! Yes, I’ve heard that too, and I’m curious as to how they’re planning on extending the story. lol But like you said, who knows if it’ll even make it to production. Thanks so much for commenting. Great review Dani. I felt like I understand the book and the main characters. I am now very interested in reading it. I like that the book is based on the historical disappearance of colony. It makes the book creepy and I love creepy novels! Yes. It does have some really creepy moments, and the whole historical aspect just makes it even better. Thanks for commenting, Anne!